Delphine is one of the top marketers in BC Canada. Delphine specializes in online marketing consultant and training for local professionals and local businesses. Her clients include real estate agents, dentists, lawyers, mortgage brokers, insurance brokers, accountants, retail stores and local services. 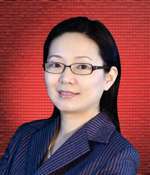 Jing has more than 15 years of experience in web based programming and development. He is our senior programming engineer. His expertise includes web application, mobile application, email and social application and more. He is very creative and talented. “Nothing is impossible!” is his motto. Jing is providing all technical support for our website creation and marketing tools.